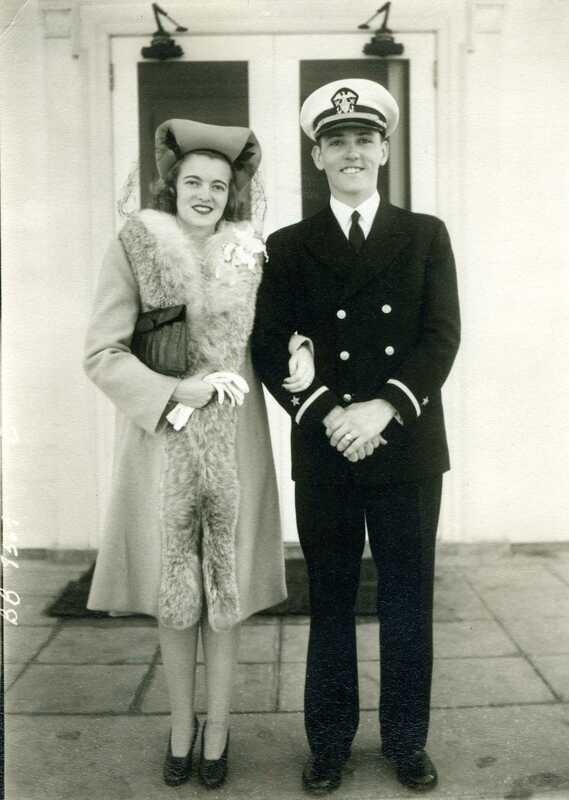 This here’s my favorite veteran—my Grandpa Cy, pictured with my Grandma Mary on their wedding day. My grandpa was barely 16 when his grandfather fronted him the money to take flying lessons. Just a few years later, Pearl Harbor happened, right in the middle of his senior year at Northwestern University. He immediately quit school and joined the Navy (this was before the Air Force) to become a flight instructor. Throughout World War II, he trained pilots all around the country—Grosse Ile, Michigan; Corpus Christi, Texas (where he & my grandmother were married), Great Lakes, Illinois and someplace out in California. He always said the scariest thing was teaching his students how to take off and land on aircraft carriers. Since all the “real” carriers were being used in combat, the military turned regular ships (barges, ferries, whatever) into pseudo-landing strips by ripping everything off the top of the boats and covering the decks with wood planking. Landing on and taking off from these jalopy-esque ships seems precarious enough, and on top of that, they were practicing on Lake Michigan, a notoriously rocky body of water. If you failed, you were going to get wet. I wish I knew how many failed landings he had to bail on. His stomach was never the same, after doing that day after day, he said. Eventually, enough pilots were ready for war, and my grandpa then went to the Pacific to help transport planes to real aircraft carriers. Once the war ended, he remained active in the Naval Reserves. He was never without a plane for the rest of his life. The man loved to fly. Well, that’s my little Memorial Day story. I’m so incredibly grateful to everyone who has spent time serving in our military. If you have a spare minute, thank a veteran. Today is for them. This entry was posted in Uncategorized and tagged family by highplainsthrifter. Bookmark the permalink. Aw, I have to agree with you on that! Absolutely love the photo – what a treasure!